“The Bachelorette” host Chris Harrison welcome onto the stage Bachelorette Kaitlyn Bristowe with her freshly crowned suitor Shawn Booth who got her final rose in the show’s season 11 finale episode. It was deja vu for “The Bachelorette” runner-up for the second time Nick Viall. Nick said at the end, he felt like a fool, and idiot and blind-sided. He said he chose to trust Kaitlyn and be confident of the relationship. Host Chris Harrison asked him about the pre-existing relationship with Kaitlyn. Nick answered that “at first, obviously really quick…a text message. Then phone calls and video chats” He described it as a “friendship, unexpected” and “innocent.” When they started talking, Kaitlyn was not the Bachelorette yet. Nick said they had “a lot of great conversations”. But, he said he knew there would be a risk for him to show-up in person to try to join the show. The biggest frustration for Nick was how people reacted. On their “first date” in Dublin, Nick said it wasn’t just a “hook-up” They had already talked about getting engaged and were open to falling in love with each other, he stated. Nick said what happened when they were intimate, it was a build-up of what they had already established. Nick called Shawn’s hate for him just “silly”. Harrison said it’s really rare in the 14 years he’s been hosting The Bachelor when two guys on the show just really don’t get along. Shawn explained his feelings as he doesn’t like being fake and can’t try and be nice to someone that he doesn’t have a good feeling about. He said “something was off” with Nick. When Harrison asked him to explain. Shawn said “something was said at the house” and didn’t want to elaborate. Nick said a lot of what Shawn was feeling was probably based on his reputation from Andi’s season and hopes that people don’t judge him based on what they’ve seen on TV. He said he never got the chance to know Shawn. Shawn replied that he didn’t base it on Nick’s past season, but just didn’t have a good feeling about Nick based on things he heard and observed in the house. Shawn said no one had a stronger connection with Kaitlyn than him, and he was never jealous of any one guy in particular. He said he didn’t like see the woman he loves go off with another guy in general. Shawn and Nick didn’t hug it out” like Harrison wanted them to make-up. But, they both agreed that their feuding did take away many good moments that they had with Kaitlyn that weren’t shown because show producers wanted to get their fighting instead. 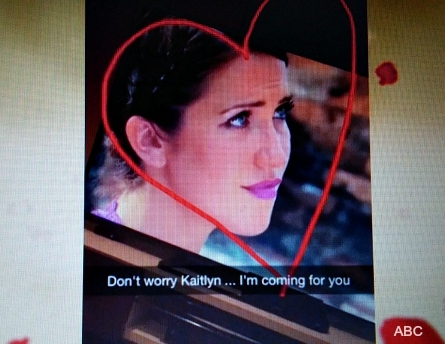 Kaitlyn explained to Nick after he asked her why she told him she loved him that “at the end of the day, no love that I had was as strong as I had for Shawn.” Nick stated on taking a chance to be with Kaitlyn, if he had not pursued her on the show, he’d be sitting in his living room at home wondering “what if”. But, now he knows. The show played back the painful break-up between Kaitlyn and Nick when he didn’t get the final rose. Nick told her what he had with her was “greater than a moment.” After the play-back, It was extremely awkward for Kaitlyn. Nick had many questions for Kaitlyn as to why she chose to break it off with him that way. Kaitlyn said breaking-up with Nick was excruciating and wondered if she should went to him that morning before he picked-out the ring, but then decided that five hours later it would be just as difficult. Nick said as that final day went on, he grew more confident. Nick made an excellent point by reminding Kaitlyn that he had told her once she knew that he wasn’t the one, she should have told him. But she chose to let him go through the whole process of picking out the ring and preparing the engagement speech. He said it was a moment and words that he won’t have back and that were meant for someone else. Harrison asked them what’s next for them. Kaitlyn said they wok up that morning and though “It’s Christmas!” and can’t wait to live life normally together and do things like grab coffee from Starbucks or Dunkin Donuts. Shawn said the best thing is now he can stand-up and defend Kaitlyn. He stated that she is the strongest woman that he’s ever known. He said he couldn’t stand sitting back watching her go through all the attacks from cyber bullies.